Went and met a FB-Friend in Real-Life, did lunch, chatted a bit, and caught Will Smith's new movie After Earth. Reviewers seemed to hate it (11% approval). But it was much better rated by viewers (36%). And I thought it was about as good as the Star Trek movie. Not as good of action, or even pacing, but the story was much more unique. And made some effort to be original with their view of Tech Advances, and coming up with original lines. You have to wonder where the idea of guns went -- I'd much rather shoot bad things than only use a fancy sword on them. But I figure Liberals got their way on gun control, and life was now more dangerous for everyone, this is what it would be like. That isn't to say it was great. 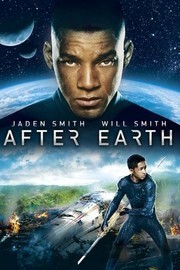 It was obviously a way for Will Smith to help his son advance his mediocre career. But his son did fine, and I didn't walk out feeling cheated for my money. But it wasn't horribly memorable or "good" either. Just a way to kill 2 hours, if you're bored. Waiting for video will lose you nothing in translation. This page was last edited on 2 February 2019, at 15:13.